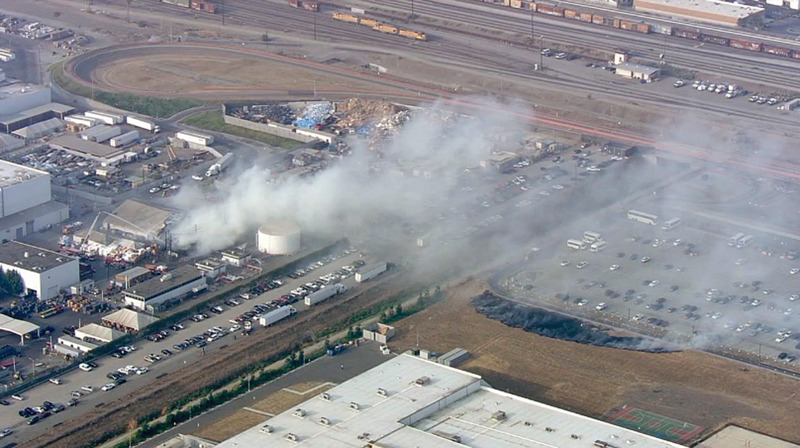 Screenshot via KTVUAn aerial view of the area where a fire erupted near the Tesla factory in Fremont, California, on Thursday, August 23. Fire crews responded to a fire that erupted near the Tesla factory in Fremont, California, on Thursday afternoon. Local news media showed an unidentified building engulfed in flames. The Fremont Fire Department said the flames started in a “cardboard pile” around 8:20 p.m. ET, an unidentified building also caught fire. A small patch of grass ignited along a fence near a Tesla parking lot, a statement from the automaker said. The flames were extinguished by 9:00 p.m. ET and no injuries were reported. 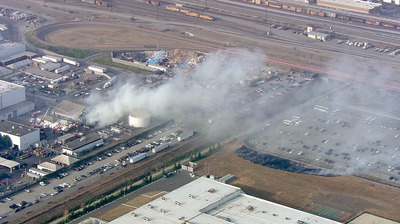 Fire crews in Fremont, California, responded to a fire that erupted near the Tesla factory on Thursday afternoon. The Fremont Fire Department said the flames started in a cardboard pile around 8:20 p.m. ET, on the southern end of Tesla’s property, igniting an unidentified building. Aerial video from local news outlets showed firefighters dousing the flames with water. Another video showed a building engulfed in flames. Tesla said in a statement that a small patch of grass fire ignited near its parking lot. The fire was contained by 9:00 p.m., but firefighters remained on site to make sure there was no further threat. There were no reports of injuries, according to a Fremont Fire spokesperson. The cause of the fire is under investigation.